Wall Street hasn't been fond of Anheuser Busch InBev's or Brookfield Renewable Partners' stock lately. Here's why you should be. At any given moment in a bull or bear market, a few stocks are going to be singled out by Wall Street as duds. Wall Street isn't right all the time, though, or it could be playing a very different game than individual investors looking to build wealth over the long term rather than meeting quarterly performance targets. Two dividend stocks that have been the targets of Wall Street's ire are Anheuser Busch InBev (NYSE:BUD) and Brookfield Renewable Partners (NYSE:BEP). When you look at the long-term prospects of these companies, however, it's hard to see what it doesn't like. Here's why you may want to consider buying them now while the Street assigns them discount valuations. It's easy to be negative about AB InBev if you only look at the company's North America results. Sales volumes in North America were down 4.9% this past quarter, and there are articles everywhere highlighting America's inclination toward wine, spirits, or even away from alcohol toward cannabis. If you're focused solely on North America, though, then you are overlooking some of AB InBev's greatest opportunities. 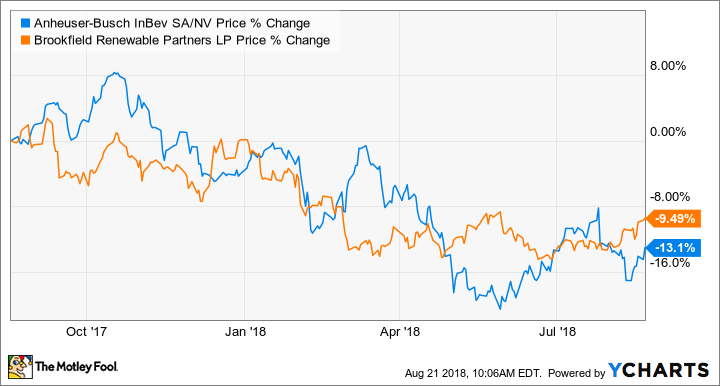 The combination of AB InBev and SABMiller back in 2016 was a monumental undertaking that made it far and away the largest brewer in the world, giving it access to some of the fastest-growing markets for beer that will likely drive sales for decades. The two regions that stand out the most for the company right now are Latin America and Africa. This past quarter, EBITDA for all three of its Latin America segments were up by double digits, and EBITDA in South Africa was up 21%. The combination of larger, faster-growing populations and increasing living standards across these two continents gives AB InBev growth opportunities that can more than make up for the declining revenue in North America. The integration of the two brewers has been at the forefront of management's attention for the past two years, but it appears that they have completed enough of that work to introduce its next growth initiatives. As part of the company's investor seminar earlier this month, management highlighted three new breweries it plans to open in Nigeria, Mozambique, and Tanzania within a year that will help launch its growth efforts on the continent. The potential in these markets alone should make investors excited about the potential for AB InBev. To sweeten the pot for investors, the stock has a dividend yield of 5%. If investors can look past the weakening North America market, there is an incredible long-term investment opportunity for the world's largest brewer. There are lots of reason to like Brookfield Renewable Partners as a dividend stock. The company's suite of power-generating assets are contracted under long-term fixed rates to protect against volatile prices, it has a manageable balance sheet, and it has a track record of creating shareholder value as it has grown 16% annually since it went public back in 2000. These kinds of traits in and of themselves don't make Brookfield Renewable Partners a great investment, though. There are loads of companies that have fixed revenue contracts and manageable balance sheets, but not all of them have created shareholder value. All too often, management teams with these advantages in their back pockets make the mistake of prioritizing payout growth or some other "growth at all costs" model. This tends to lead to overpaying for assets and stretching the company's cash flow too thin for big payouts. What really separates Brookfield Renewable Partners is its management team, which actively avoids these situations. Management eschews acquiring projects simply for growth's sake and instead looks for out-of-favor assets. For example, it acquired Colombia's Isagen in 2016 for the minimum auction price set by the Colombian government and was able to acquire both TerraForm Power and TerraForm Global through the bankruptcy proceedings of their former parent company, SunEdison. Sniffing out these distressed assets, buying them on the cheap, and then squeezing out costs by integrating them into its portfolio mean Brookfield is consistently acquiring assets with high rates of return. What's more, management also makes it a habit of retaining a decent amount of cash each quarter to fund its own projects and expansions. It currently has its own projects under development that will grow cash from operations by 3%-5% annually through 2023. Couple that with contracted rate increases, operating efficiencies, and potential acquisitions, and management intends to grow its payout to investors by 5%-9% for the foreseeable future. Despite all these qualities that point to a fabulous income investment with the potential to grow, the stock currently has a dividend yield of 6.4%. You'll be hard-pressed to find a quality investment with a yield that high.